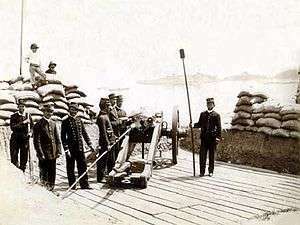 A Brazilian battery at Rio de Janeiro in 1894. The Brazilian Naval Revolts, or the Revoltas da Armada (in Portuguese), were armed mutinies promoted mainly by Admirals Custódio José de Melo and Saldanha Da Gama and their fleet of Brazilian Navy ships against the unconstitutional staying in power of the central government in Rio de Janeiro. The Brazilian government received support from the United States, although military involvement was minor during the conflict. In November 1891, President Marshal Deodoro da Fonseca, amid a political crisis compounded by the effects of an economic crisis, in flagrant violation of the new constitution, decided to "solve" the political crisis by ordering the closure of Congress, supported mainly by Paulista oligarchy. The Navy, still resented by circumstances and outcomes of the coup that had put an end to the monarchy in Brazil, under the leadership of Admiral Custódio José de Melo, rose up and threatened to bombard the town of Rio de Janeiro, then capital of the Republic. To avoid a civil war, Marshal Deodoro resigned the presidency in 23 November. With the resignation of Deodoro, after just nine months from the beginning of his administration, the vice president, Floriano Peixoto, took office (1892). The 1891 Constitution, however, provided for a new election if the presidency or vice-presidency became vacant sooner than two years in office. The opposition then accused Floriano of staying as head of the nation illegally. The second revolt started in March 1892, when thirteen generals sent a letter and manifesto to the President Marshal Floriano Peixoto. This document demanded new elections be called to fulfill the constitutional provision and ensure internal tranquility in the nation. Floriano harshly suppressed the movement, ordering the arrest of their leaders. Thus, not legally solved, the political tensions increased. The revolt broke out in September 1893 at Rio de Janeiro, and was suppressed only in March 1894 after a long blockade of the city. Rebel battleship Aquidaban bombarding the forts of Rio de Janeiro (drawing of Fouqueray, according to a photography, published in Le Monde Illustré, nº 1.916, 1893.). With many of the Brazilian Navy's most powerful ships either in the hands of the rebels or under repair, the Brazilian government had to improvise a new fleet to battle the rebel fleet. The "cardboard squadron" had to face off against a mutiny that had overtaken most of the powerful ships of the original navy. 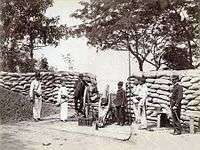 Local bloody conflicts in some regions of Brazil ensued. The navy's mutiny off Rio de Janeiro (Guanabara Bay) also was a challenge, and became linked to the Federalist Rebellion. 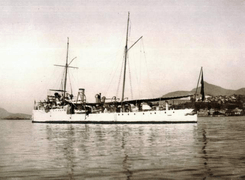 Loyalist torpedo-boat destroyer "Gustavo Sampaio"
The revolt included the powerful battleship Aquidaban and a collection of small ironclads, modern cruisers and older wood 'cruiser' or steam frigate type ships. Two of the navy's major ships were overseas and supposedly away from the conflict: the battleship Riachuelo was under repairs in France, and the corvette Barrozo was on a round-the world training voyage (during which she sank). This did not leave the government with much left to challenge the mutineers, who could have controlled the seas and influenced the concurrent conflicts on land. The government basically bought itself a new naval force on the open markets, of small and sometimes unusual ships including torpedo gunboats, various medium and small torpedo boats, small armed yachts, and a transport converted to carry a Zalinsky "dynamite gun" (a pneumatic gun launching a dynamite charge of massive explosive force and marginal accuracy). Such improvised stocking up was common at that time: the US pressed a similar mix of ships into action to supplement its fleet in the 1898 war with Spain (or to buy them before Spain could), and Japan also scrambled to purchase available ships for its conflict with Russia in 1904-5. In this case, however, the new fleet was dedicated to confronting the original navy of the same country. ↑ Brassey, Thomas Allnutt "The Naval Annual; 1894" Elibron Classics/Adamant Media Corporation 2006, Chapter XI "The Naval Revolt in Brazil"